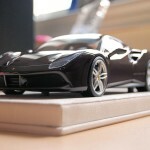 DiecastSociety.com has crossed into the dark side, but not in a negative way! 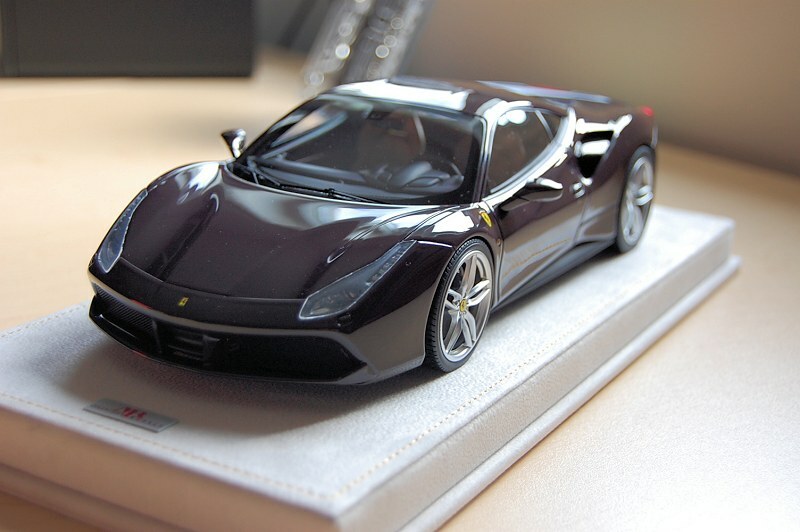 We have our first review of an MR Collection Model, the 1:18 Ferrari 488 GTB – in Dark Metallic Red (AKA Vinnacia). Before we get into the details, we’d like to highlight the MR Collection brand. 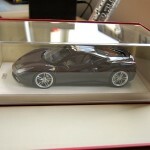 MR Collection Models has been producing models for over 25 years. 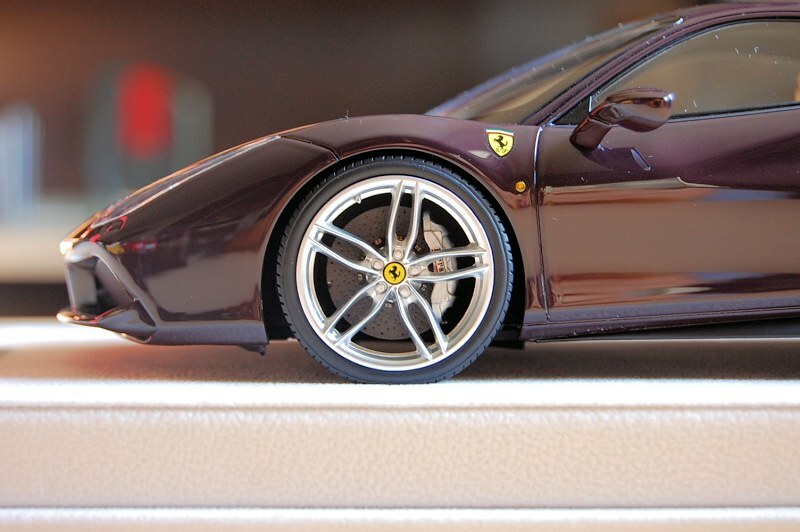 Their bread and butter is definitely the Ferrari marque, though they hold official licenses with Lamborghini, Alfa Romeo, Audi, Volkswagen, Bentley, Bugatti and Porsche. 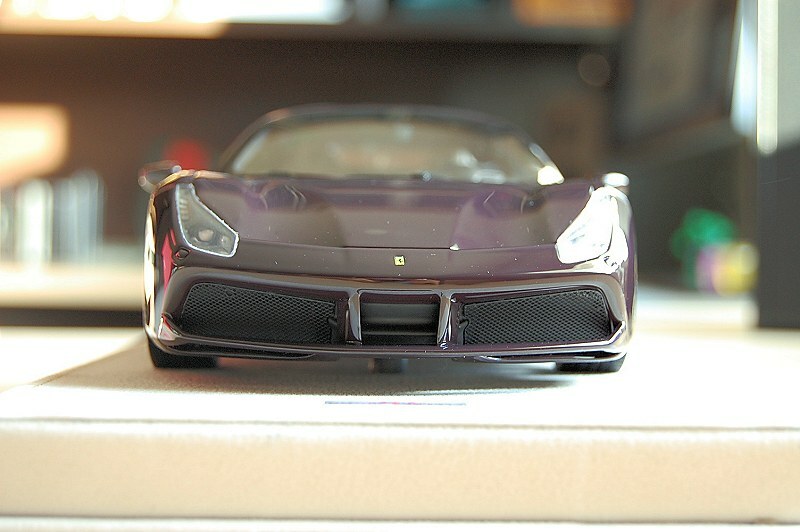 MR Collection has also back-boned projects for the likes of Hot Wheels Elite and Kyosho. 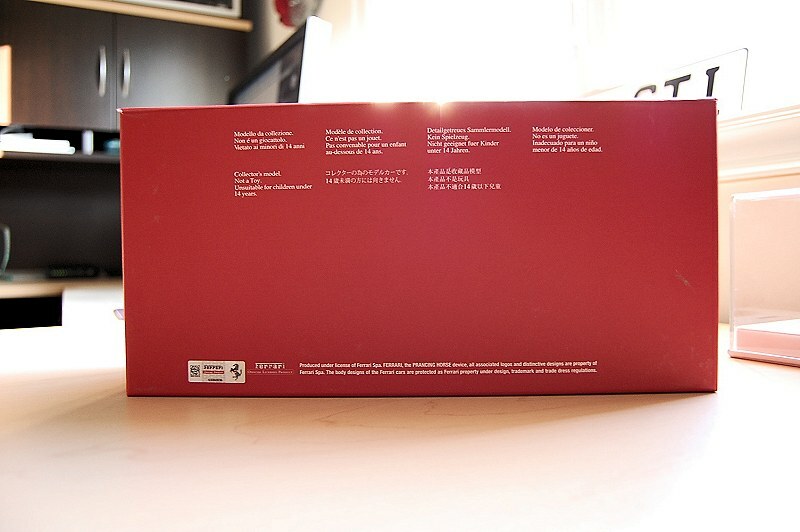 Since this is our first official review from this brand, I decided to highlight the packaging for the model. 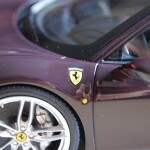 If you’re like me, then you haven’t seen an MR model up close or in detail. 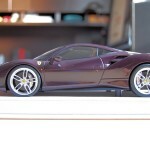 The Ferrari 488 GTB is presented in a red box, utilizing a thick paper stock box that is lined with alcantara or alcantara-style fabric. 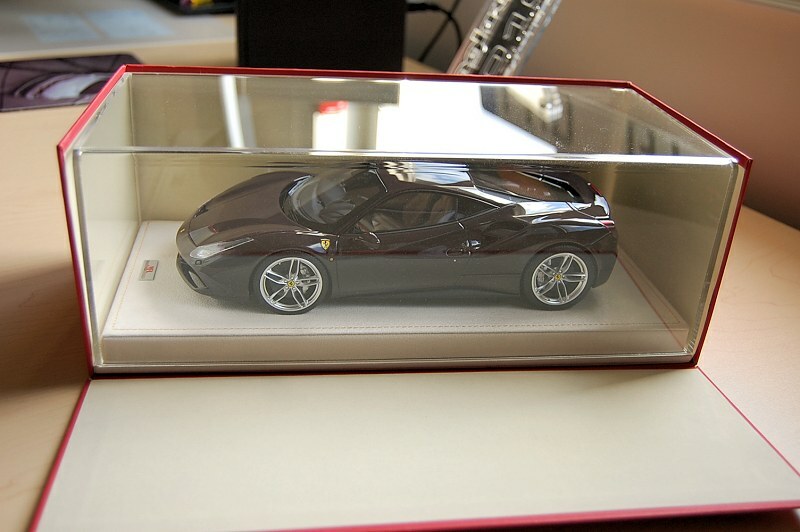 The upper section of the box features the Ferrari badge and the MR Collection logo as well. 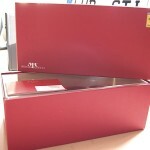 The bottom portion of the opposite end features the traditional manufacturer call outs and legal workings. The upper section slides upward to reveal the masterpiece underneath. 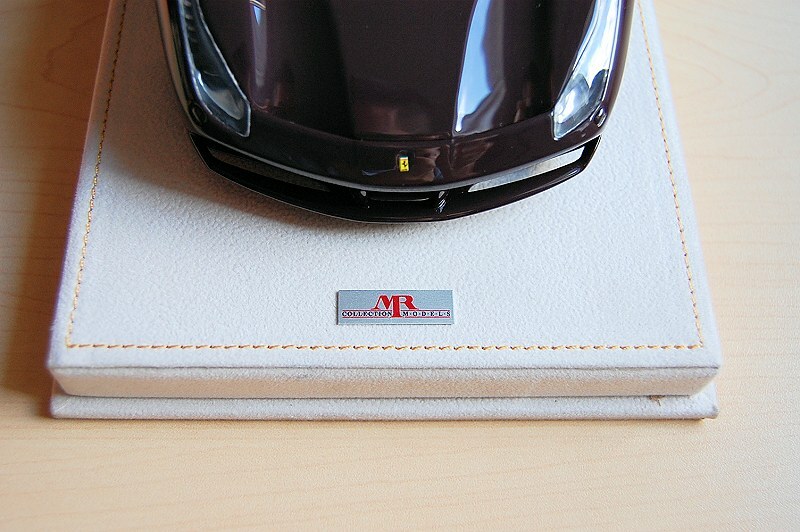 This particular model is set on an alcantara base featuring the MR Collection Model logo on the front. 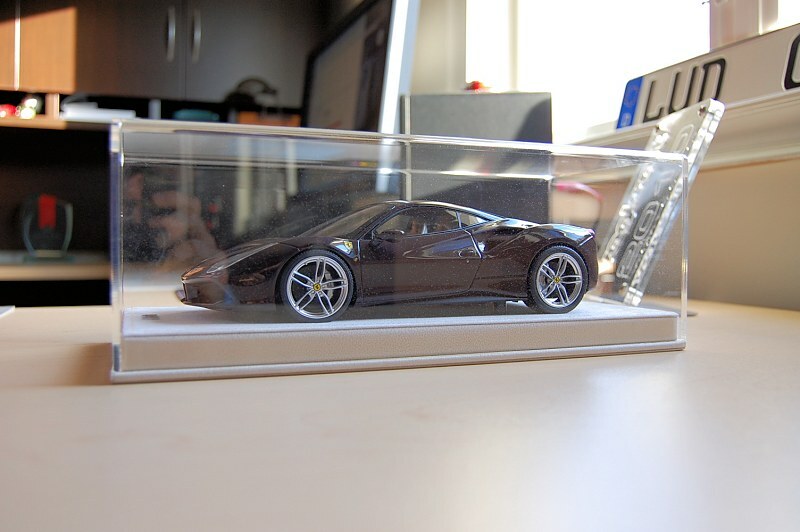 There is a plexi-glass cover to keep the unwanted elements out. All pieces are manufactured to MR’s high standards and it shows. One thing I found striking was the overall weight of the total package. IT IS HEAVY! I’m not sure what elements constitute the weight as I can’t figure out how to separate the model from the base. LOL, I’ve seen the same question asked many times over, and now I need to ask myself. How do you separate two? MR, I think it would be a good idea to include these instructions. Underneath the base you’ll find a Warranty Certificate. 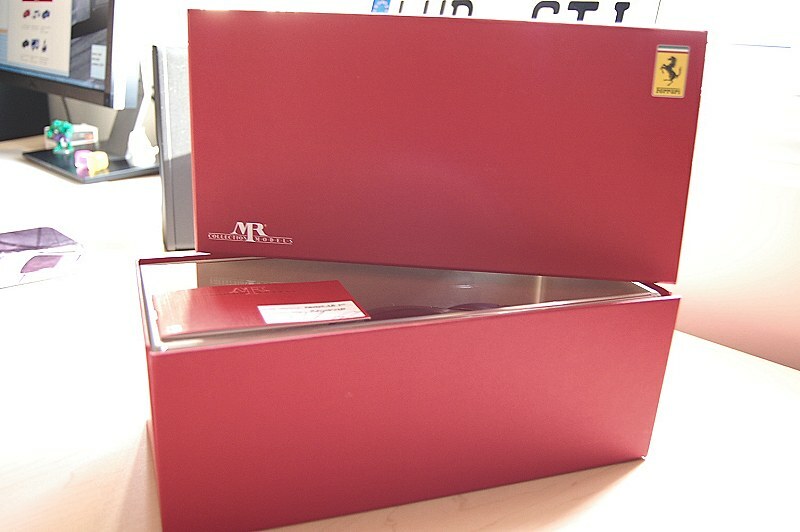 Each piece that leaves the MR Collection facility is visually inspected in detail and hand-signed by the inspector. 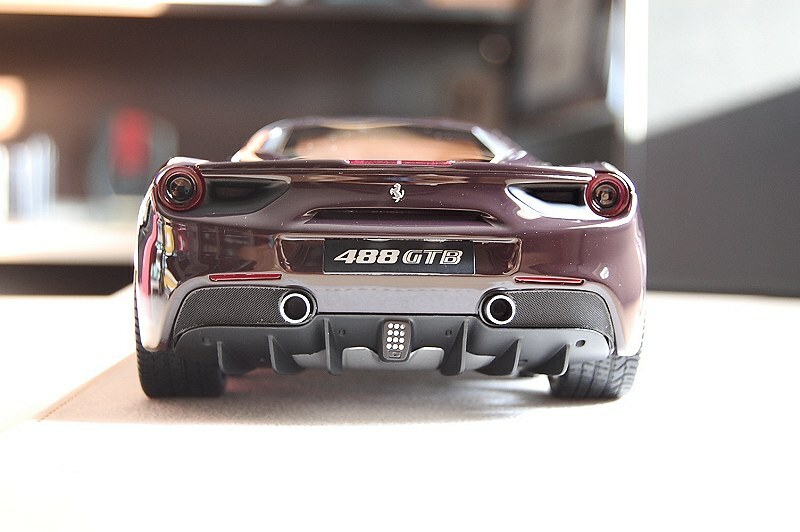 The production run of your particular model is hand written as well, the Ferrari 488 GTB we present here is #32 of 49 worldwide. Talk about exclusivity! 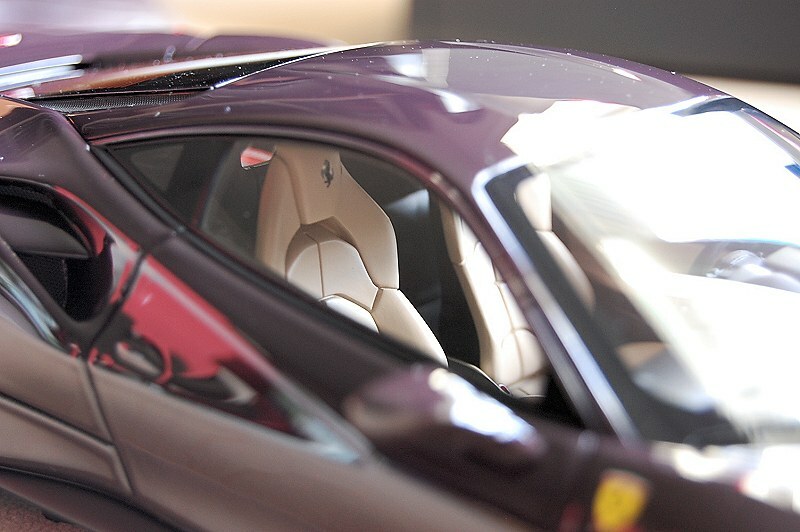 From the outside, the model is just striking. The exterior paint is some of the best I’ve seen to date. 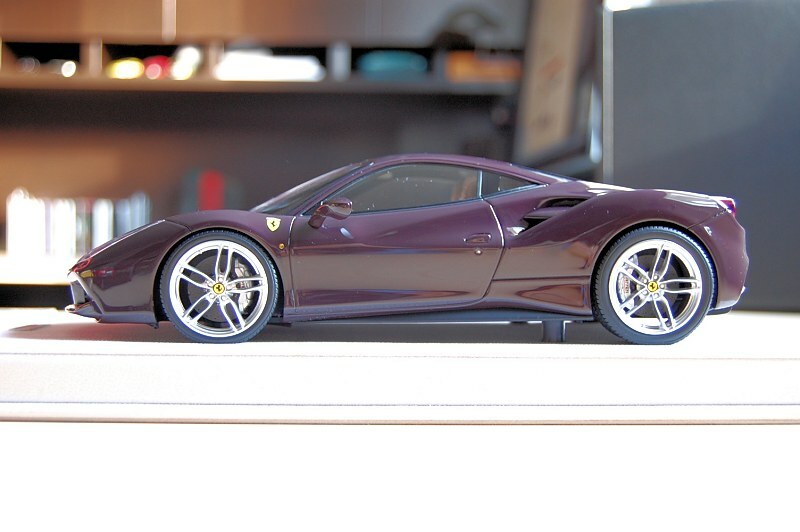 The colour is surely something very unique, maybe not the first choice for Ferrari purists, but kudos to MR Collection for taking chances and thinking outside the box. 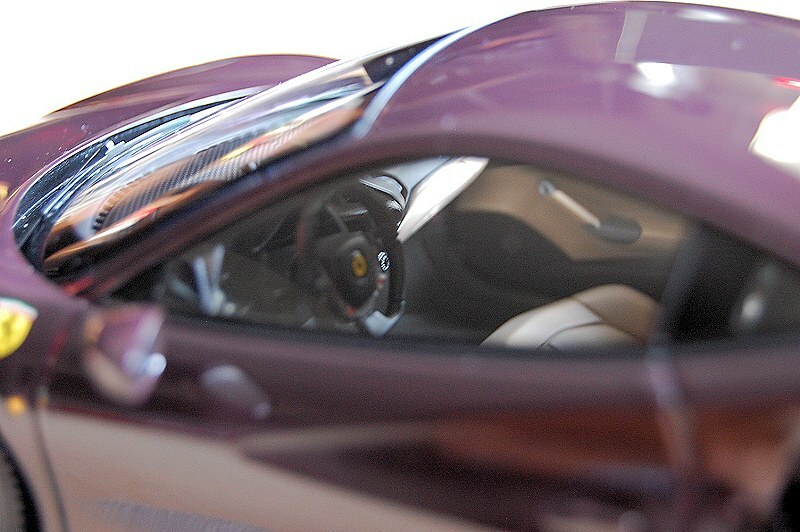 Overall lines capture the beauty of the 488 GTB nicely. Ride stance is in line with the 1:1, and overall materials and craftsmanship exude quality. 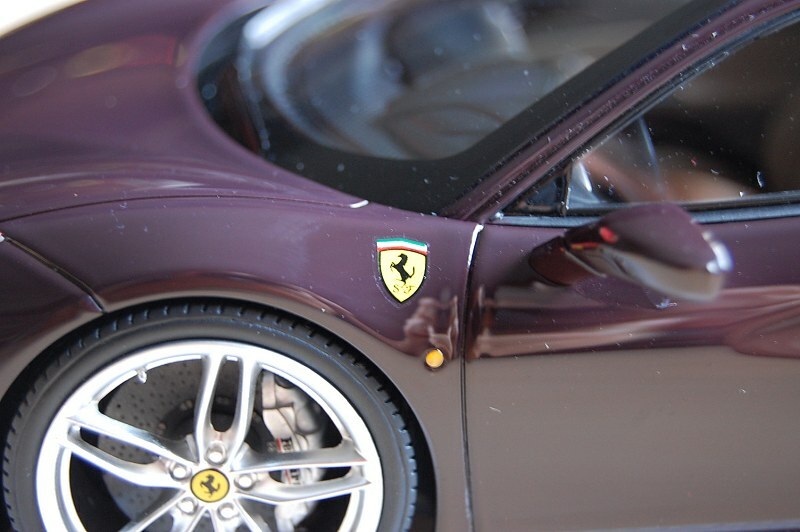 The body finish work is nothing less than beautiful, you can definitely see they leave no stone untouched. 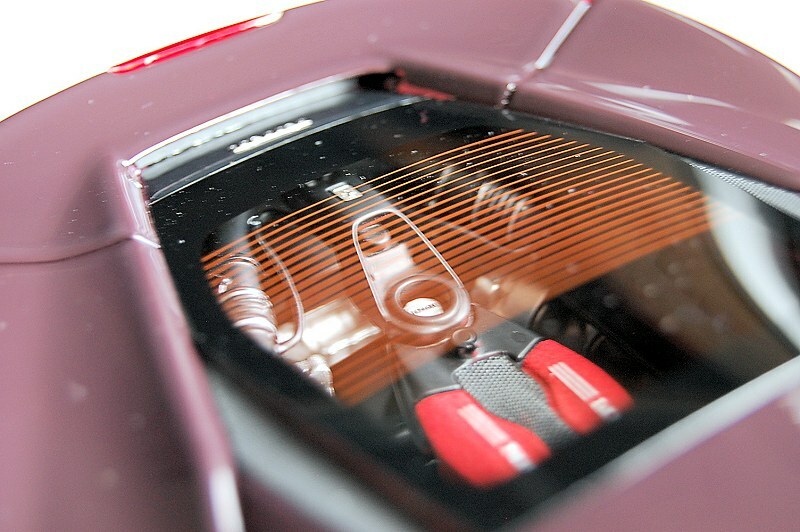 The upper motor cooling intakes also have grilles in place, though we prefer to see metal versus decals. 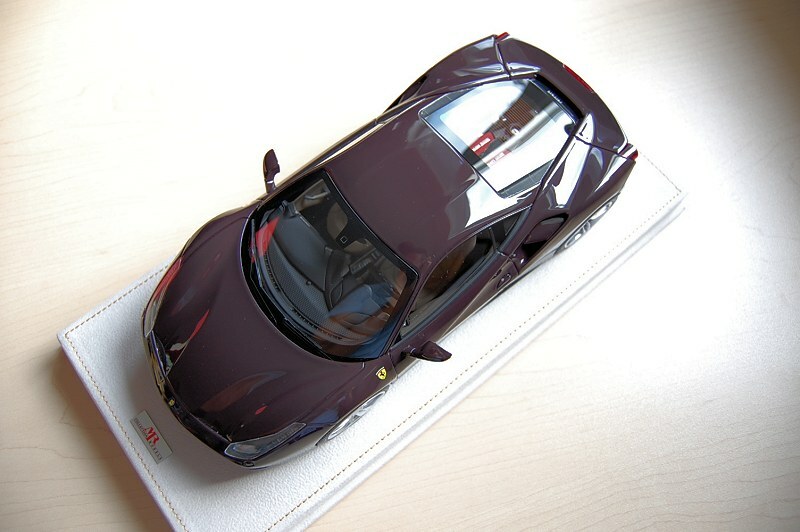 Looking at the model from the front, we can see the use of perforated metal parts for the lower grilles. 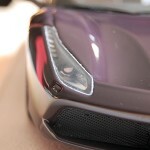 Headlights are nicely detailed too, but they could use a little more finesse in pre-sanding of edges. 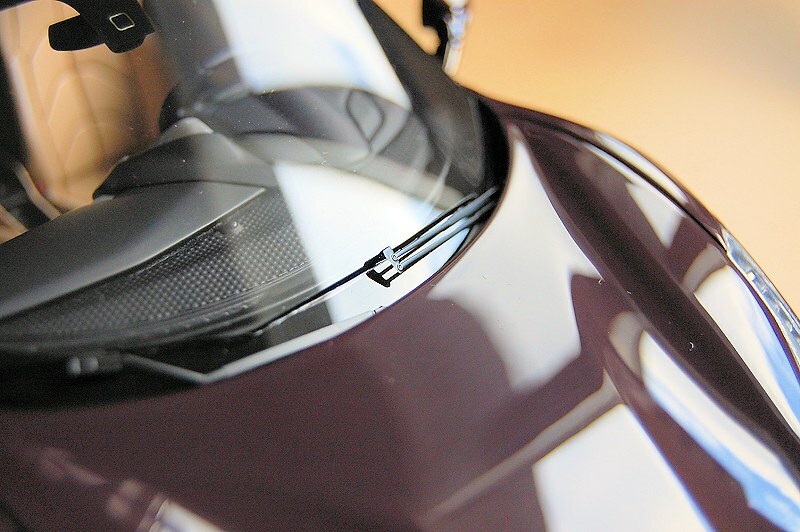 Logo on the front hood is a decal – most likely subbed for a 3D piece due to scale. 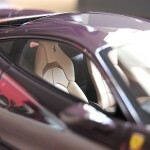 The attention to detail is also found in the windshield wipers, they are a work of art in their own right. The rear is much like the front, very nicely executed. 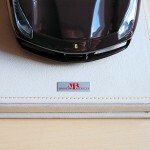 Ferrari name badge and horse are photo-etched pieces. 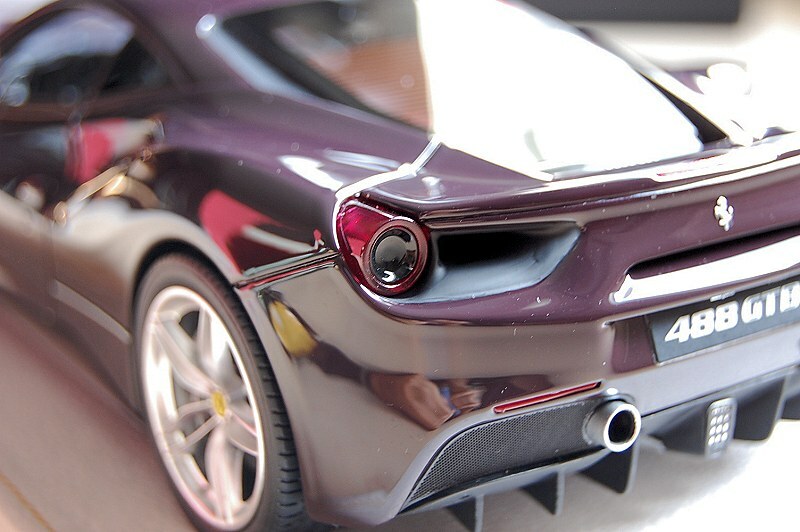 Exhaust tips are beauty executed, life-like in appearance. 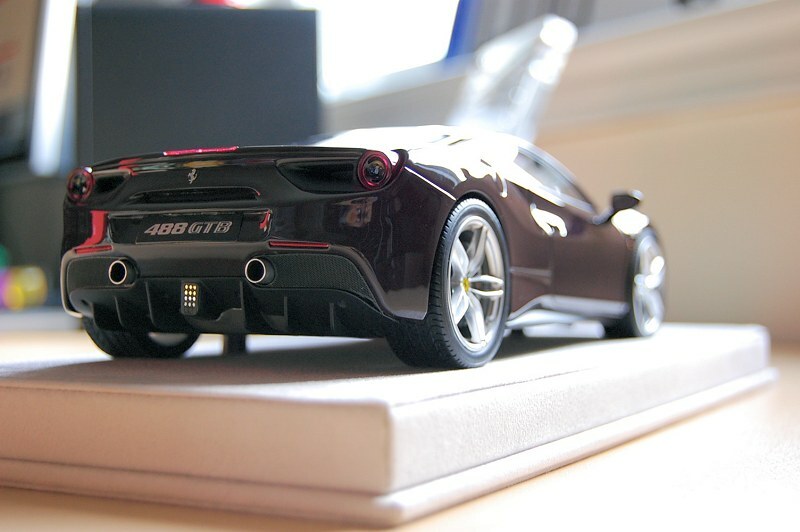 The materials used on the taillights are superb, almost like glass in appearance! 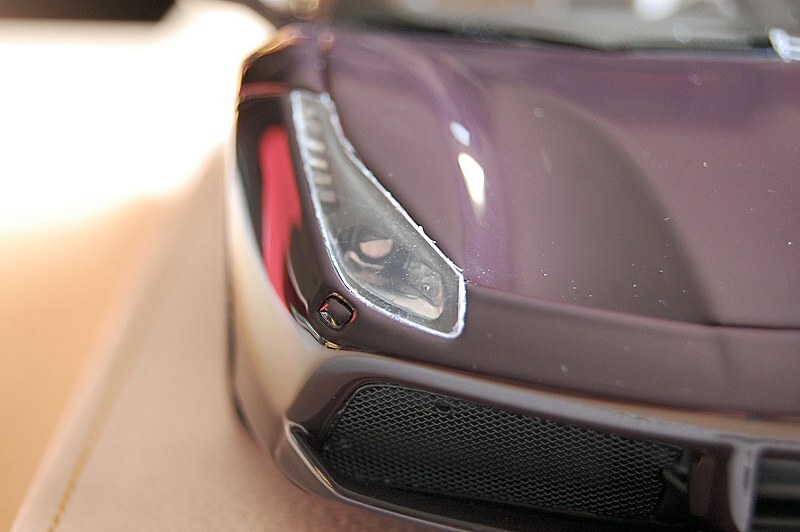 The only miss is the slightly off kilter placement of the lower centre light – see image. 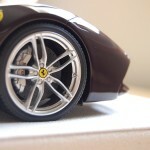 The wheels are always my favourite part on a model; they can make or break any piece. MR Collection did not disappoint here. If I’m not mistaken, MR cast their wheels in metal, and feature detail right down to the valve stem! 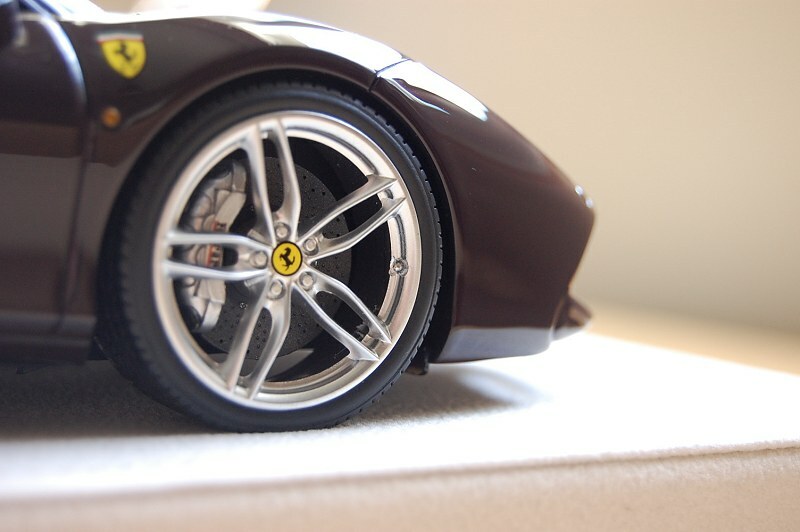 This model features carbon fibre rotors with massive silver calipers front and rear. The entire package works without compromise. 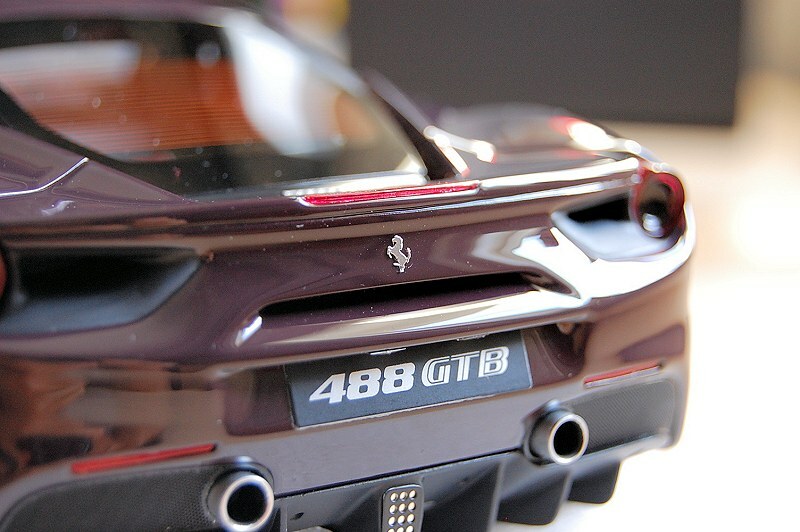 The engine of the Ferrari 488 GTB is something to marvel, a 3.9L V8 Twin Turbo producing in the range of 660 plus horsepower and 561 lb·ft of torque! MR Collection doesn’t disappoint with their rendition of the power plant. 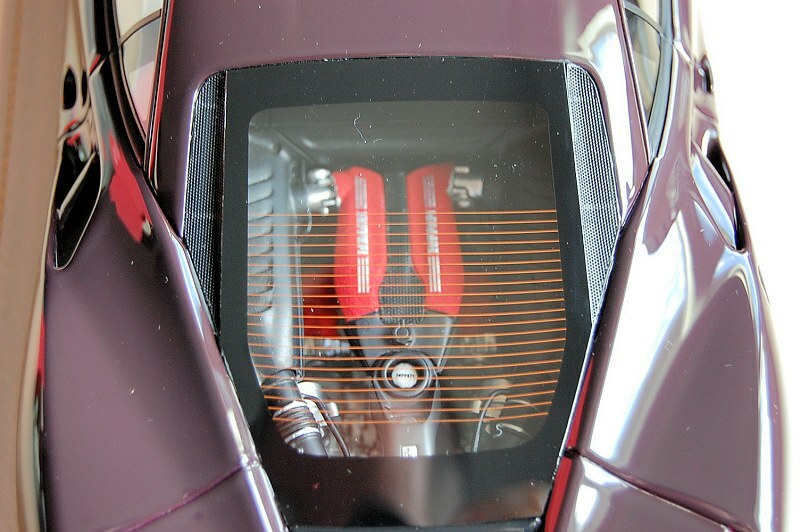 The motor features photo-etched parts, multiple layers, engine block, transmission, and intakes all visible and highly detailed. 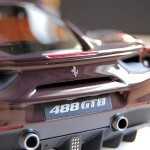 The best part, and something I’ve yet to see on any Ferrari model, is the red textured intakes, they look fantastic! 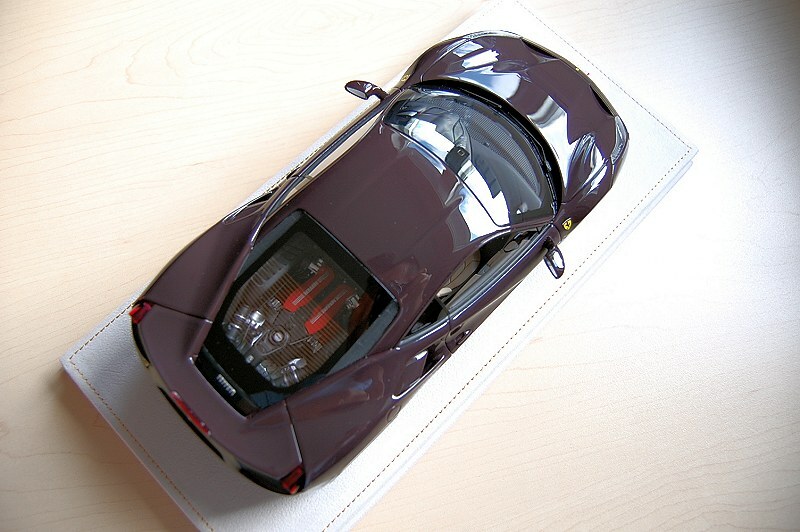 The interior of the model is replicated in a two-tone finish with black and tan. 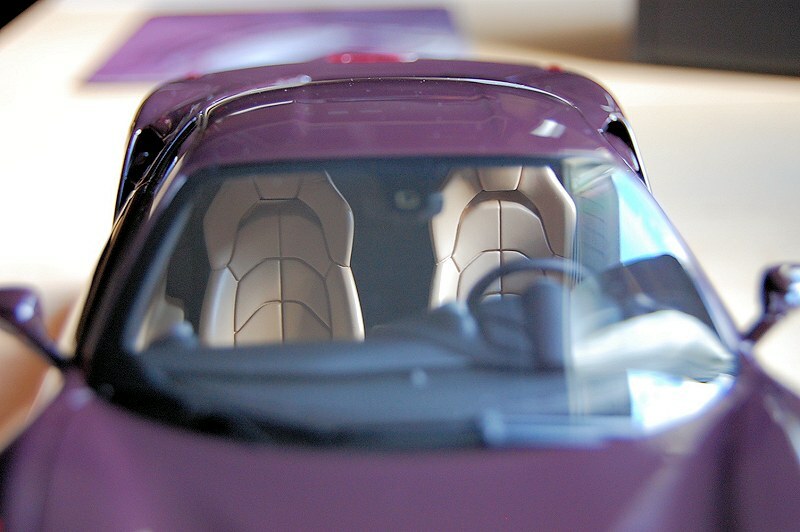 All elements of the cockpit are highly detailed – this includes the dash, centre console, seats, and door cards. I apologize in advance for the poor photos. Trust me, you’ll be impressed with the quality and craftsmanship. Even the roof line is clean and nicely painted! 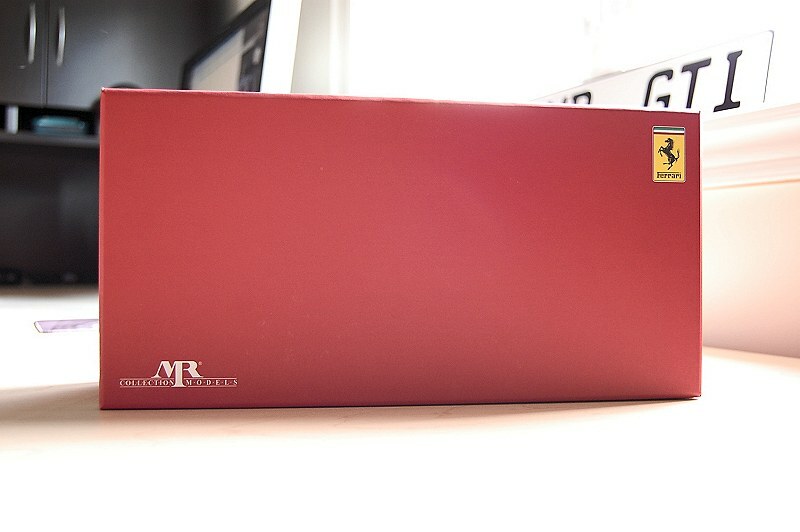 This is the first MR Collection Model I had the pleasure of reviewing. I must say, I’m quite impressed with the overall execution and presentation. 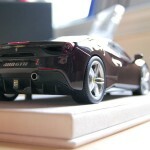 As I said earlier, this is by far the best resin model I’ve seen to date. It is near perfect from all angles. But being this good does come with a price, the model costs north of $500 CND, which, on average, is about 2-3 times the cost of a quality priced model today. We all know handmade craftsmanship, exclusivity and being first to market comes with a price. What price are you willing to pay? MR Collection definitely serves a niche in our hobby, I for one am glad they are here. Thanks for the opportunity guys, another 25 more years! Enjoy the pics!! 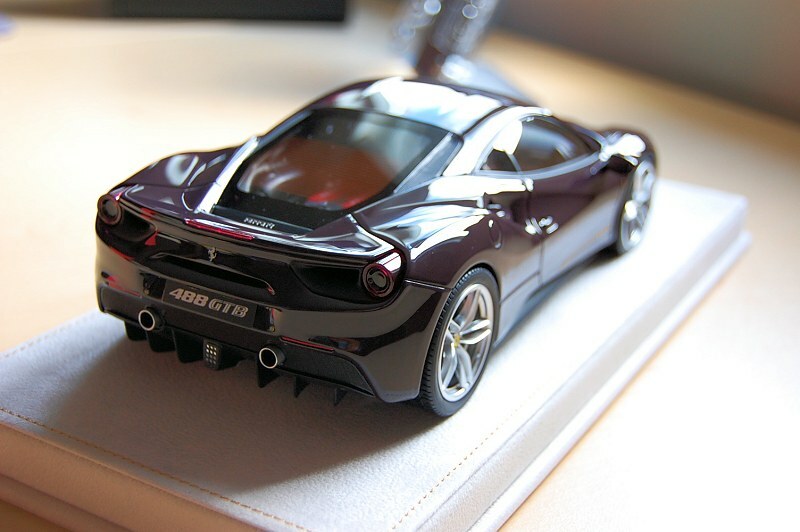 10 Responses to "REVIEW: MR Collection Ferrari 488 GTB – Dark Metallic Red"
Good point about the base tho. I have a MR Speciale as well and from what I know you can take the base cover off as there is a think layer underneath that can be taken off and that will reveal the screws. Georgeous model. 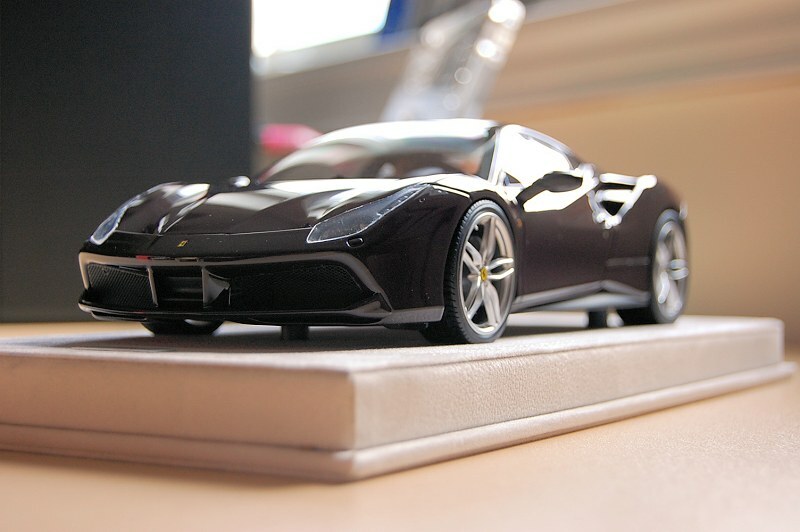 I also have the 458 Speciale and it’s on a completely different level. One of my favourite pieces in my collection. Nice model, in a truly horrendous color. Everyone is entitled to their opinion, but it this case I believe you are wrong. The colour is stunning! Nice model with an original color (i would say eggplant) but what a shame to sell a such expensive model with the rear tail light misplaced! At this level of price, you should expect absolutely no problem! I have stopped collecting MR for a long time. There are better resin alternatives out there. 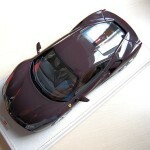 But if one is targeting Ferraris and Lambos, then the options are much more limited. You would expect anyone to know this, but what I’m missing here is that it is hand made. Hence the price. Although prices do seem to go up rapidly, since they are produced in such imited numbers, you have to grab one while you can! Good point. I revised the final paragraph because of this. Can’t wait to see her in my showcase. What a beauty!